Pantera, Italian for panther, a very powerful animal that adapts well to a variety of habitats. 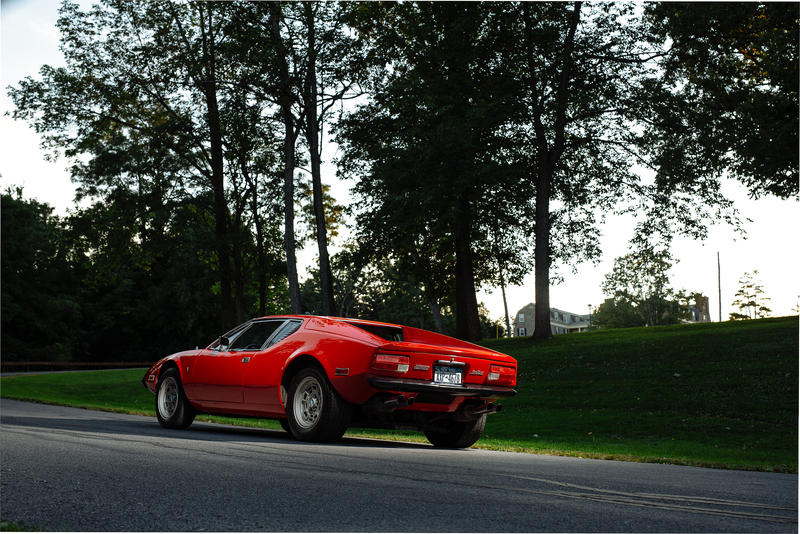 From 1971 to 1974 the De Tomaso car company of Modena, Italy produced the De Tomaso Pantera, a mid-engine supercar for export to the U.S. market. This new Italian design sports car was sold through Lincoln-Mercury dealerships. 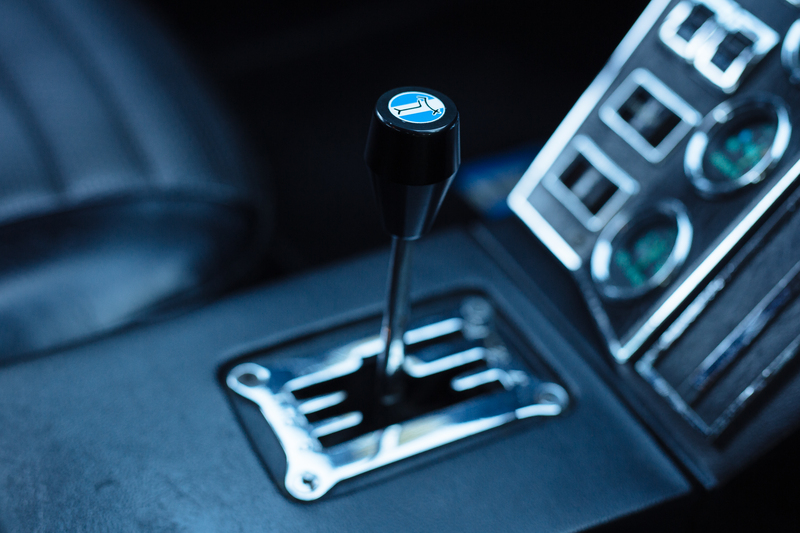 It was an Italian supercar design with a pure American rip-snorting-high horsepower V8 of the time. Ford was looking to follow up the now discontinued Shelby Cobra run of sports cars with something to compete with the Chevy Corvettes and the Ferrari Dinos of the day. Ford through their Lincoln-Mercury dealerships sold approximately 5,500 Panteras in the U.S. until Ford decided to stop the import of these cars in 1975. 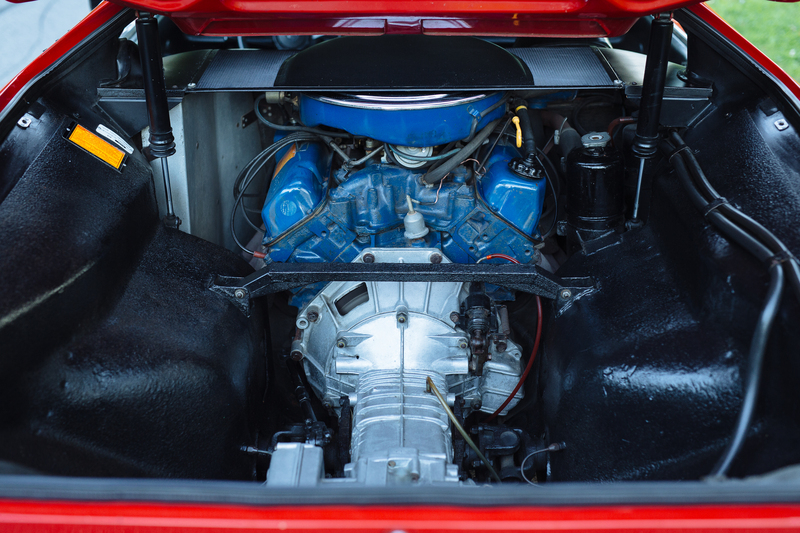 At that time the Pantera was powered by Ford’s 351 cubic inch high torque Cleveland engine producing 335 hp, although later testing showed it put out more like 380 horses. Acceleration 0-60 mph was a swift 5.5 seconds, top speed of 159 mph, with a 0-100 mph run of only 14.1 seconds, all very respectable for the time. 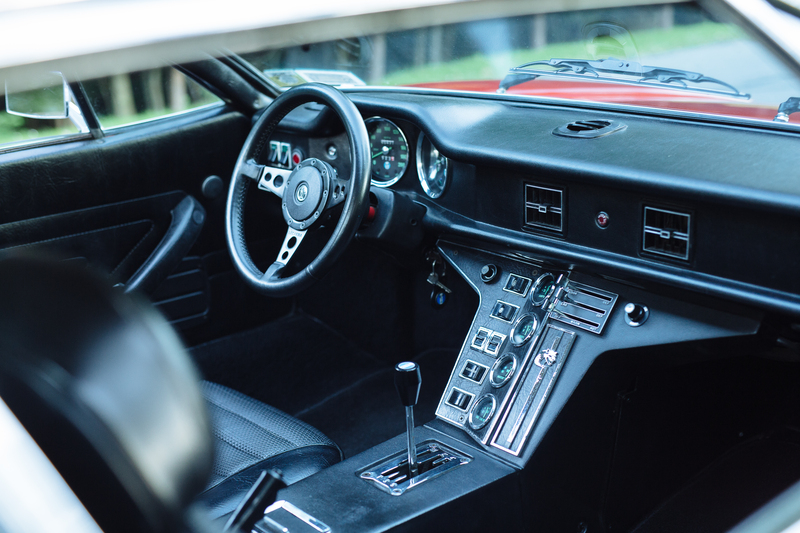 The magazine “Road Test” named the Pantera its “Import Car of the Year” for 1973 beating out marques such as Ferrari, Maserati, Lamborghini, and Porsche. 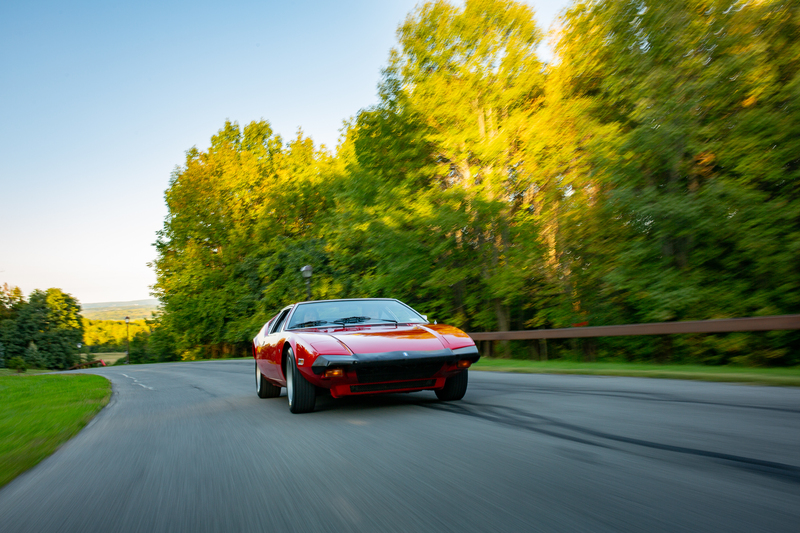 However, after Ford’s decision to stop importation of the car, De Tomaso continued to build several forms of the Pantera for the rest of the world until the final production in 1992. During the 1980’s there were several gray market Panteras imported to the U.S. by the importers of the day. 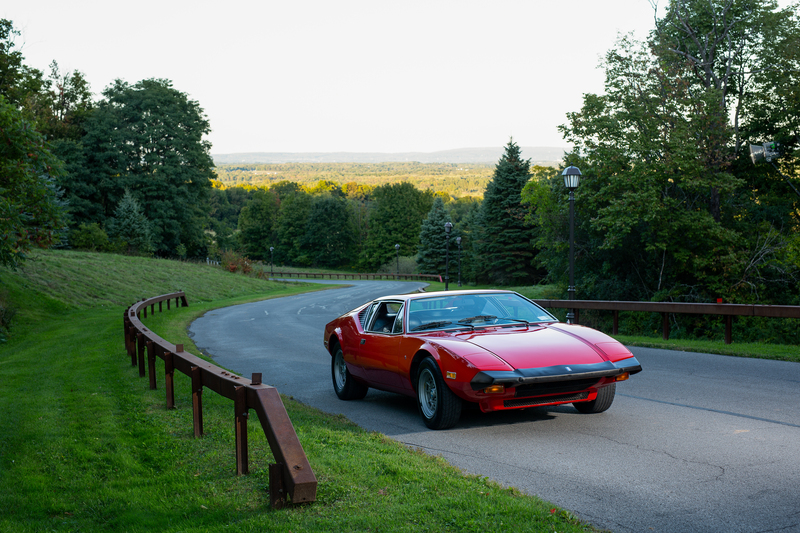 In the twenty plus year production run, De Tomaso made slightly over seven thousand Panteras for the U.S. and world markets. 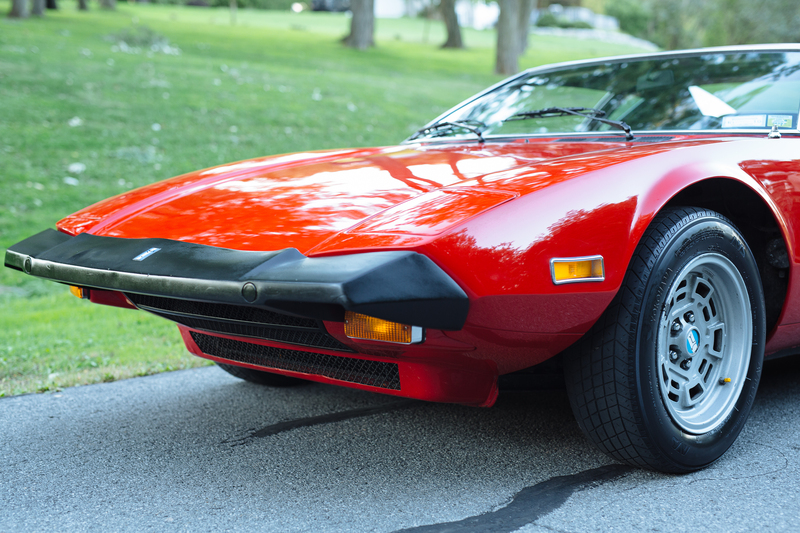 This “Rosso Corsa” colored De Tomaso Pantera you see here is owned by Paul Staskowski of Oriskany Falls. Paul is the second owner of this exotic Italian produced semi-wedge shaped super sports car. When growing up, Paul was looking through one of his father’s Motor Trend magazines and that’s when he fell in love with the looks of this Italian bred sports car. 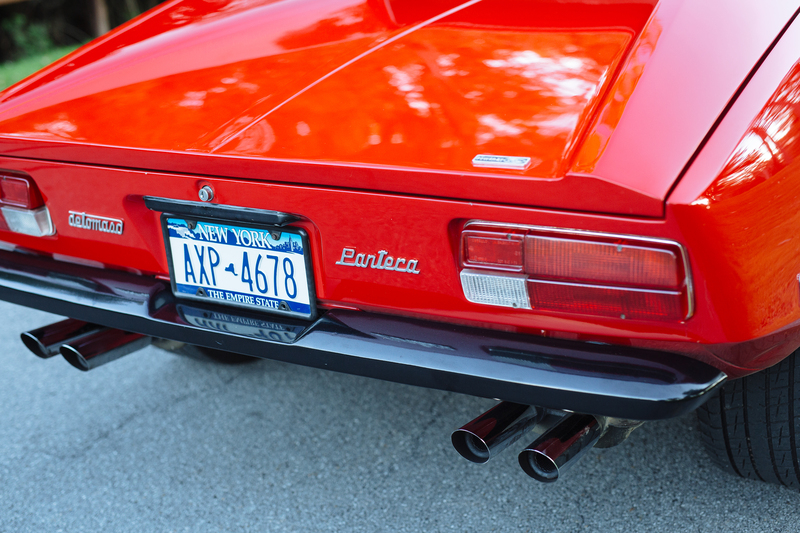 A boy’s first love, a De Tomaso Pantera, doesn’t get any better than this. Paul’s search for a mostly unmodified Pantera led him around the country as many Panteras of the day were modified. 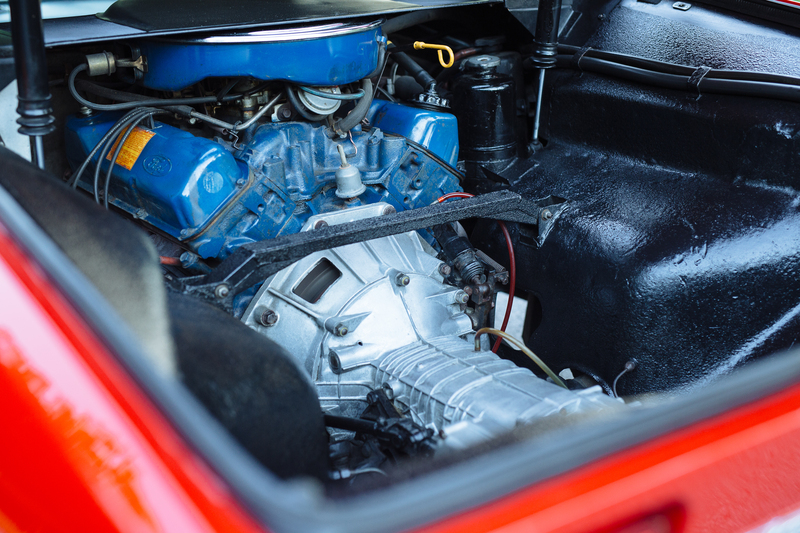 Owners would change and update the carbureted fuel system and make other engine modifications along with many other modern day mods to make the car go faster and/or louder. Paul wanted a Pantera that was pretty much original, as he is a fan of the “keep it original club.” Paul’s extensive online search brought him to a small exotic dealer outside the Detroit, Michigan area. This particular Pantera was not the first car Paul traveled to check out, however it was the car he envisioned owning. A total unmolested automobile with the interior and exterior top notch with reasonable miles were all items on Paul’s want list. Paul also desired a vehicle that he could drive, not a trailer queen. This car was pretty much all original from the interior, exterior, engine, and even the wheels, which are often replaced. After Paul and his oldest son went to Detroit to look at this particular car, Paul decided it was the one he had been looking for. This Pantera was delivered in May of 2000 which made Paul the proud owner of a classy 1974 Pantera supercar with only 48,000 miles on the clock. Since then, Paul and his siblings have logged an additional 12,000 to the odometer. 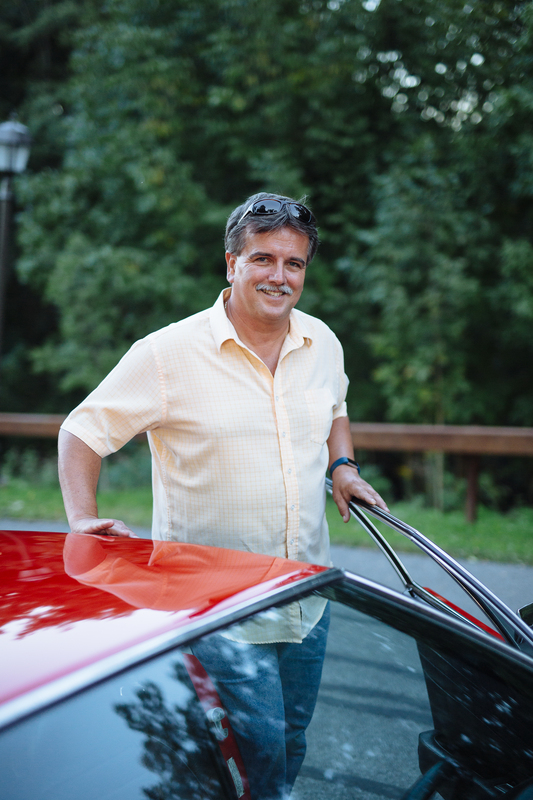 Paul’s younger sons share his love of cars. These two younger sons were lucky enough to get their father’s blessing to take the Pantera to each of their respective Senior Proms. 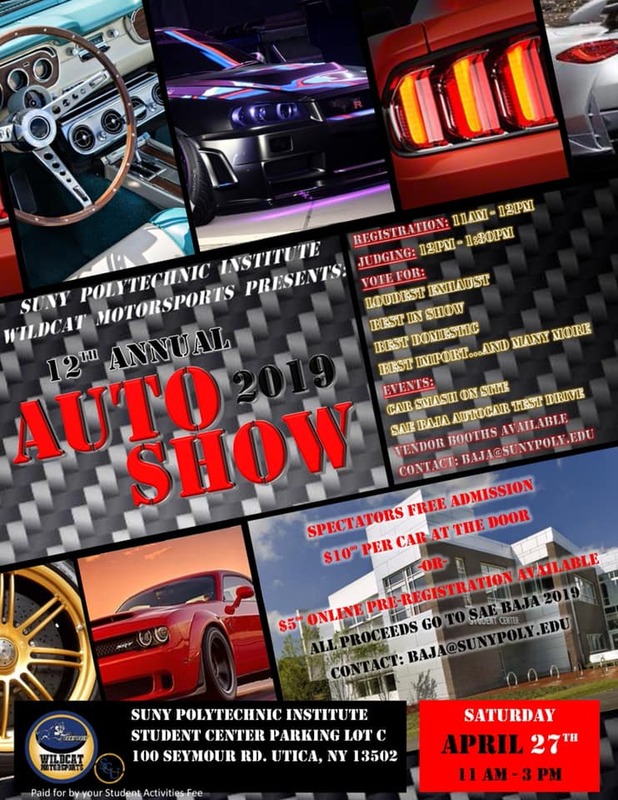 Additionally, these same two sons drove his Pantera to one of the “Historic Vehicle Associations” events and now it is part of the selective group of “This Car Matters.” Paul also has a young daughter, who at this point in time is enjoying his selective group of automobiles. Paul has motor oil in his veins which goes back many years. His father grew up in the Detroit area and was known for many of his automobiles. His father started out with a Model A, moved along to a Graham-Paige, early first year Mustang, and early Firebird just to name a few. Paul’s older brother was interested in sports cars as well. He taught Paul how to drive standard shift in his Triumph TR3. Consequently, his older brother’s TR3 stuck with him all these years as Paul now owns one himself. 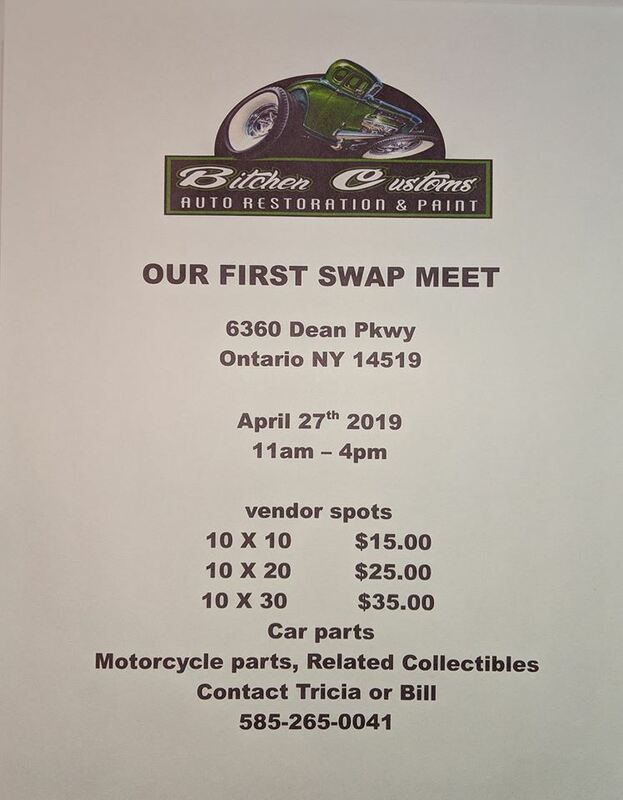 Adding to the Pantera and TR3, Paul has amassed a 1970 Trans Am, a 1980 BMW M35i (1 of only 14 imported), and to round off his stable a 1968 Chevy C10 pickup truck. Taking this Pantera for a ride, as you first approach this rose colored cat, you would gaze at the sleek lines of the Italian designed body, then as the door opens you are encouraged to step inside, sit down and buckle up for a ride that brings one back to 1974 when the Ford V8 would howl power behind your head. 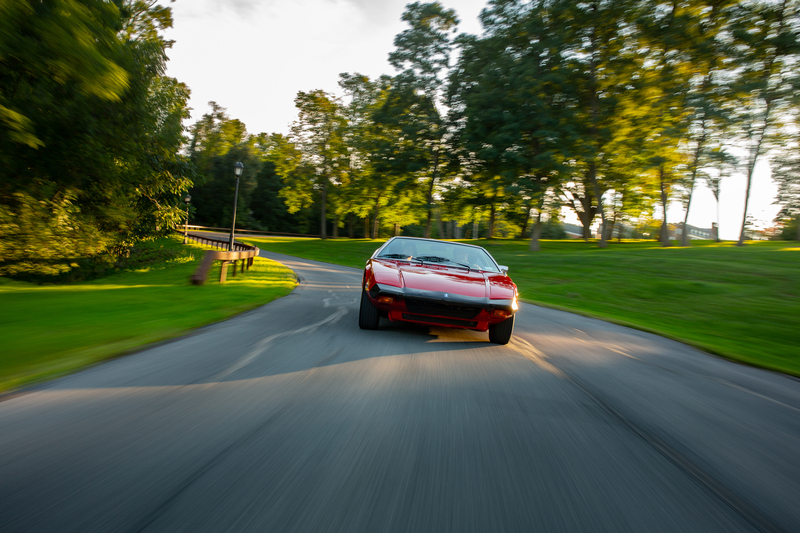 Taking this Pantera through the gears on a straight road, and then seeing curves ahead, is a sports car driver’s vision. Paul is quick to acknowledge that his biggest supporter through-it-all is his wife, Patty. She enjoys helping with the cars in the collection, and also likes going to car shows. When it came to building an expansive garage, purchasing all the cars and everything else, Patty was involved and always supports all of Paul’s endeavors, something he appreciates. We at Apex wish Paul and his sons many happy motoring miles ahead.